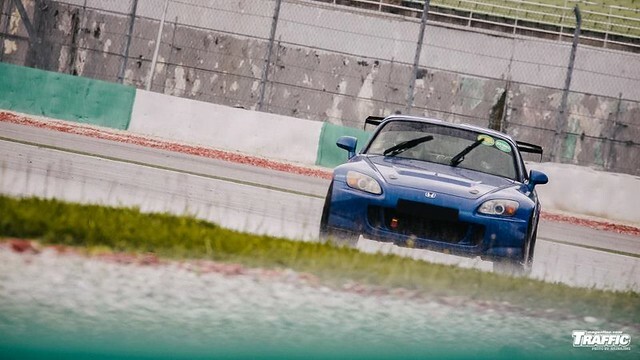 Racing with my S2000: Final(e) Stage…Rain battle! December heralded big hopes for the beginning of my push for competitive rankings among the local scene of trackies as I had emerged from November with an excellent time of 2:38 on a slightly damp Sepang track while data analysis showed I still had some way to improve so lower times were highly possible. 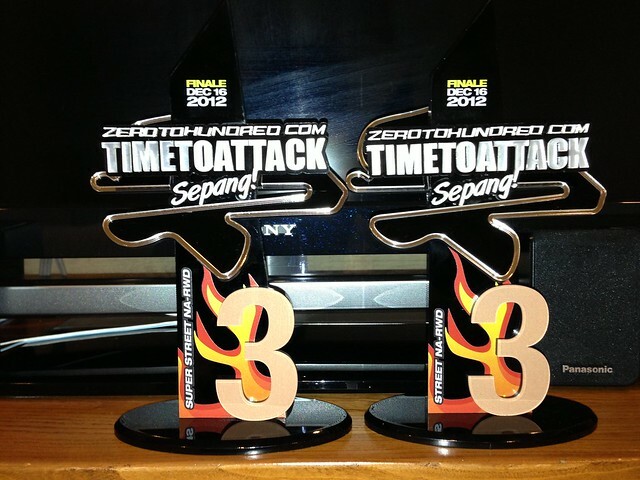 Having signed up for ZeroToHundred Time To Attack Finale, I was very keen to show my mettle on the time attack stage and hopefully take a podium position or two back as a sign of progression. Accompanied by my friend Wayn riding shotgun, we made a fuss free 300+km drive down to Sepang on the morning of 16 December and were excited to see the bevy of cars that had descended to take part. 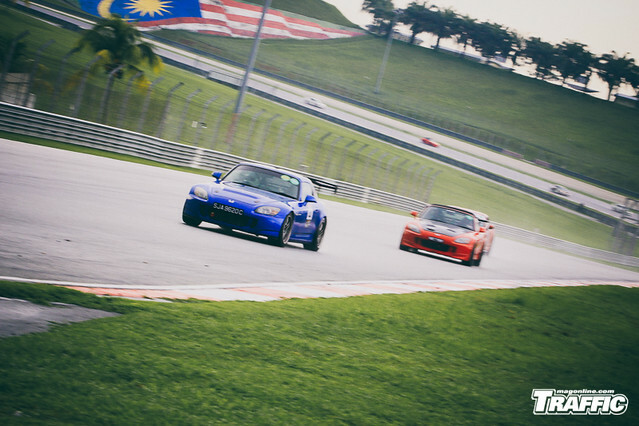 The list of cars was endless including the usual suspects of FD2Rs, Evos, WRXs and S15s. Some of the rarer entries included Lotus Exige, Toyota 86, 350Z and Toyota Altezza. Plenty of supercars had come down to take part including E63 AMG, Maclaren MP4-12C, Lamborghini and Ferrari F430 but my focus was drawn to the competitors in the class I had entered myself in. I was greeted at the registration table by the friendly smile by Angeline of the ZeroToHundred team who had taken great pains to help me with my slightly more complicated registration process. 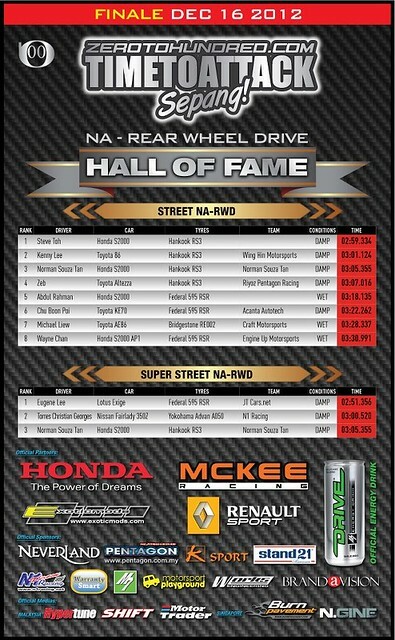 The Street NA RWD and Super Street NA RWD were the two classes I had entered to try to get a chance to podium and although I had more realistic opportunity to do well in Street NA RWD, I wanted to see how well I would do in Super Street NA RWD. 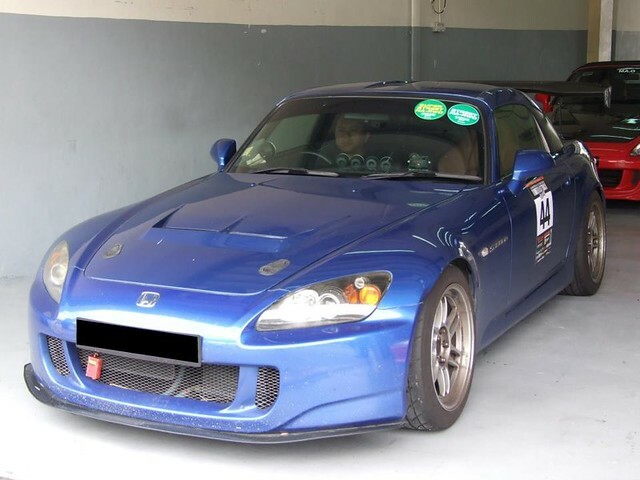 A familiar name in Street NA RWD was my friend Steve Toh in his "chilli padi" AP 1.5 who has been clocking excellent times and so far was the quickest S2000 driver I know on street tyres with a personal best a scant 0.7 secs quicker than me so in my mind he was the man to benchmark against. Another participant which seemed strong were a Wing Hin sponsored Toyota 86 which apparently had about 80K of parts just in from TRD including a gorgeous Endless front and rear big brake kit. I was also wary of the competition from the a certain Toyota Altezza which I was told was now sporting an individual throttle body kit for more power and had further handling tweaks done to it. The Super Street NA RWD class was occupied by rather few participants this round but all had strong potential to knock me out of contention from a podium. 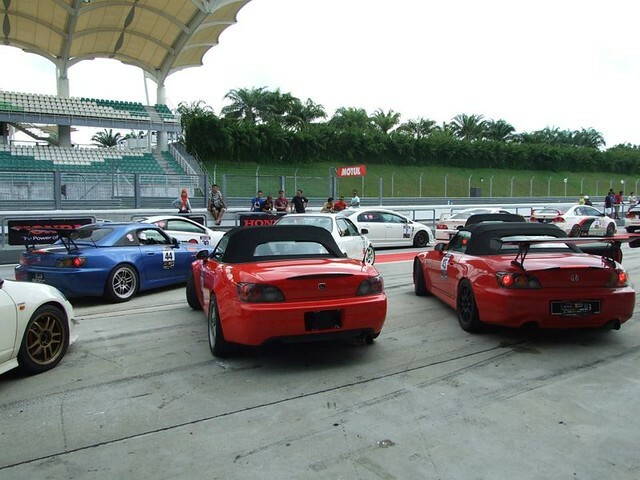 The cars included a Lotus Exige, Nissan 350Z and a V35 Skyline. It would have to take a combination of luck and skill to be competitive in both these classes and the final result was quite surprising as I would find out later. A further challenge that presented itself was that 57 cars had entered to run in NA class and it was likely that the time attack runs would have to be done with significant traffic. While I was rushing back and forth to ensure all the preparations were done right for the run, I noticed the cloud cover getting darker and darker, a really ominous sign. The Turbo and SuperCar classes were enjoying the dry but cool track temps whilst clocking properly quick times but as I began getting my helmet on, I noticed with a sinking heart that a light drizzle had begun. I queued up for the entry into the track and while we began on the warm up run got stuck behind some traffic for a lap or two. I opted to go for a gradual warm up and to get in a quick lap before the rain started in earnest. Big mistake! 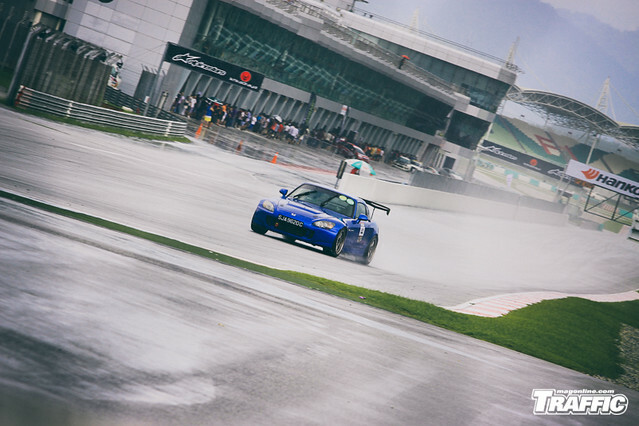 The rain escalated into a full on downpour just minutes after the NA run began meaning that the first complete lap of the circuit was the only chance anyone in the NA run had a chance of clocking a good lap. Having wasted that due to poor strategy, I was now consigned to running on a wet track with wipers on full, having lousy visibility of not being able to see cars in front of me due to the spray and dodging spinning cars left and right. I had never raced in the rain before and it was truly a challenge considering my tyres were inflated for dry run pressures, I had plenty of camber on all four corners and my spring rates were very stiff. Knowing that I had to clock the times despite the crazy conditions, I soldiered on and what a drive it was. I would be sideways at Turn 2 at the slightest provocation, sideways at Turn 3 at the end of 3rd gear, sideways at Turn 4 due to some oil, understeering at Turn 5 while very twitchy at Turn 6 and the wild nature of my setup showed itself on and on. The bad weather presented an added complication by way of a windscreen that threatened to fog up every so often and I had to constantly manage the situation with blasts of aircon to keep my visibility. The Toyota 86 proved itself excellent in these conditions probably due to better setup and was very quick in the torrential rain. I believe much of this was in part to the skill of the driver who was Kenny Lee, an S1K driver. The Lotus Exige competing in Super Street NA RWD had a driver who proved to have guts of titanium by entering corners at speeds I couldn’t muster and even after an off track excursion into the gravel at similar fast speeds, came right back on and kept on racing at the limit. It was the first time I saw FD2Rs spinning left and right with such frequency they would make one reconsider if they were front wheel drive or rear wheel drive! Ending the first run exhausted from the mental and physical challenge of wrestling the car in the wet, I was dismayed to see my times almost 30 seconds slower than my personal best and in my mind, my poor strategy might have cost me any chance of a podium. Poring through the competitor times made me realize that things might not have been that bad after all as my timing might still be good for scraping through a podium or two. I decided to stay positive and rest a little while waiting for the 2nd run for the NA group later in the afternoon and try to improve on my standings. A rumble of thunder awoke from me from my half an hour shuteye and a huge downpour began just an hour before the NA run. I knew from that moment that it was likely that the timings from the 1st run would probably determine the standings for the day considering how wet and cold things had become. To give you an idea of how bad conditions were, safety runs by the ZTH organizers needed to be done to decide if the track was safe for competition. Despite how nasty the conditions had become, I decided to still go down and run as best as I could for the 2nd NA group to see if I could improve on my times somewhat. A repeat of the earlier run's challenges played out, made worse by a much colder track, fast disappearing daylight and a strong wind which exacerbated the heavy rain. The conditions became so bad that eventually most of the NA run group decided to throw in the towel and pit. The track also was closed due to poor conditions for a bit and I decided to adopt discretion for the better part of valor and end my run for the day. Tallying up the times for the day including the slower runs for the 2nd NA group run, I realized that I had sneaked in podium finishes in both of the categories I had entered myself for. Although the manner of which I had achieved those finishes were slightly different from what I had expected, I was still happy to achieve this testament to my perseverance despite the challenges I was up against. Is there any on board video?